No need for bulk buying such as tents, studios, lights, stands, 3 pins converters etc which cost massive amounts and does not even produce the required results. Here we have now ALL in One Professional Solution that can solve all your problems which are related to listing something online. Portable LED Studio with unique design. Specification : 2.4G Wireless Controller : Two Channels, CH1 &CH2; ON/OFF/Light/Flash Mode Switch; Adjustment of A/B/C/D 4 Led groups' brightness(Single or All) Customize Setting Function 1. Self-assembly and Portable Led Studio 2. With 4 pcs LED boards formed a rhombus and effected by six sides reflective fabric, perfect photography want for no shadow and no dead angle. 3.Various openning designs, Top, Front and Macro shooting(Ø65). 4. Come with black, Yellow and White background Fabric. All accessories can be disassembled and packed in a bag. 5. Technical Specifications: A: Working Input Voltage: 110~220 V; B: Output: 20V; C: LED: 72PCS; D: Color Temperature: 5500K; E: POWER: 40W; F: Luminance: 15000~16000 LUX. Various opening designs, Top, Front and Macro shooting(Ø65). With 4 pcs LED boards formed a rhombus and effected by six sides reflective fabric, perfect photography want for no shadow and no dead angle. 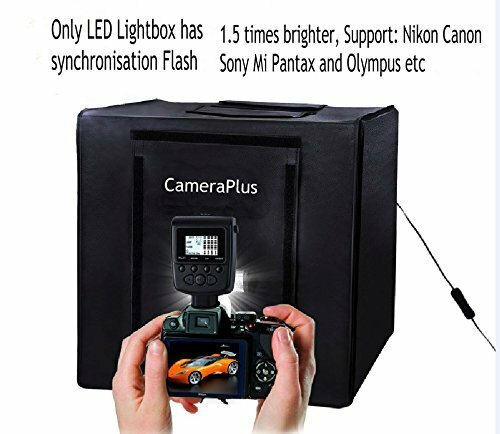 If you have any questions about this product by Cameraplus, contact us by completing and submitting the form below. If you are looking for a specif part number, please include it with your message.